These easy guitar chords will prepare you for the next step. After spending a week working on the scale and chord exercises from the “Beginner Guitar Lesson 1” page, you should now be ready to try these chord exercises and scales. 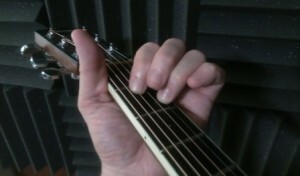 E7, A7, and D6 require the use of 2 fingers, but there is an open string in between. Also, the placement of your fingers for these chords is the same as the next group of chords you’ll learn next week that involve the use of three fingers. 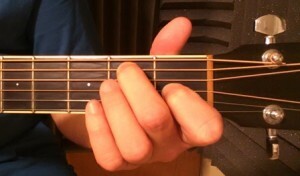 By working on these three chords, you’re preparing for the harder chords you’ll learn next week. 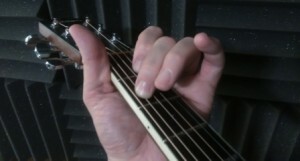 You should continue doing the same scale exercise you learned last week, but try to focus a little more on proper technique, which is discussed in my book, Beginner Guitar Chord Exercises. Each day when you practice, play along with these audio files. 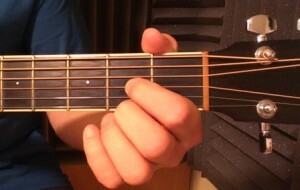 In the gallery below are picture of the guitar chords from two different angles. The first is from your point of view when holding the guitar; the second is from the point of view of you looking at someone else playing the chord. 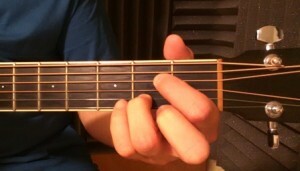 Make sure you use the fingerings presented in the pictures above, as this will prepare you for the next step of playing the E major, A major, and D major chords which involve the use of three fingers. Also, by practicing using the first and third fingers for A7 and then using your first and second fingers for E7 and D6, you’ll develop more control over the individual fingers. If you focus on this right away with these easy guitar chords, you’ll have much less difficulty in the upcoming lessons with the harder chords that you’ll be playing.